Gladstone Provincial Park is most well known for the vehicle accessible Texas Creek campground which is a destination campground. The park also has significant wilderness value. It provides a diversity of habitats in the Selkirk Foothills ecosection of the province that is found nowhere else. These include Kokanee spawning areas, winter range for deer and elk, and of particular importance, low elevation habitats and old growth cedar and hemlock forests. There are several short trails that lead from the campground to the lake. Christina Lake has a reputation as one of the warmest and clearest lakes in Canada. There are several pocket beaches that provide great opportunities for privacy and quiet moments. The Monashee Mountains surround the lake and it is a perfect backdrop for a variety of water-oriented recreational activities. Fishing for Kokanee, rainbow trout and small-mouth bass is popular. The protection of spawning areas in the park such as Sandner Creek is extremely important. Poison Ivy: A low plant with three glossy, bright green leaves and white berries. Wear shoes when hiking, especially in underbrush. Calamine lotion is an effective treatment. Trail maintenance has been reduced on all trails in Gladstone Provincial Park. Although these trails remain open, users may encounter fallen trees and/or trail wash-outs. Extra caution is advised. Texas Creek Campground is 100% reservable. There is no long term trailer storage permitted at the Texas Creek boat launch. Any trailers left in the parking lot for more than 14 days per calendar year are subject to removal and fines. Xenia Lake Campground, in Gladstone Provincial Park, can be reached by road via the Miller Creek Forest Service Road, located at Km 23 on the North Fork Road, north of Grand Forks. The forest service road reaches the Provincial Park boundary at km 8.3; make a right turn on a rough road for another 1 km east and you will arrive at the campgound on the lake. This last kilometre is very rough and in poor condition. There are 3 campsites on the lake. Please keep the sites clean and carry out all garbage. Groupsite camping and day-use picnicking are not available in this park. 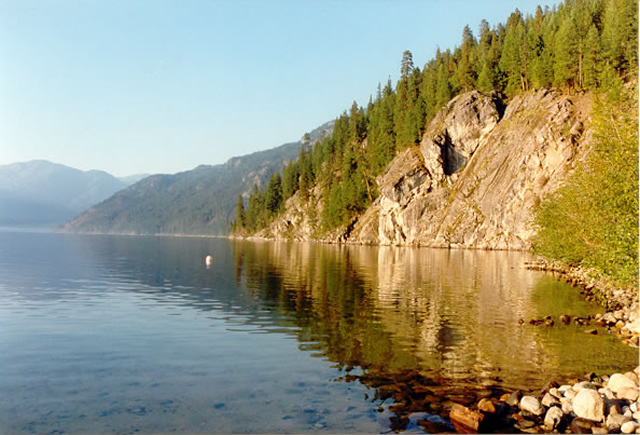 Gladstone Park is located approximately 20 km northeast of Grand Forks on Hwy 3 at the north end of Christina Lake in the Monashee Mountains. The most common accesses to the park are via the Texas Creek campground and by boat from Christina Lake. The campground is 5 km east of Christina Lake on Hwy 3; turn onto East Lake Drive and follow 4 km to the 63 site campground at the end of the road. There is rough 4WD access to Xenia Lake 22 km up the North Fork Rd from Grand Forks to Miller Creek Rd; turn right and go about 4 km. Look for a small road on the left marked with a white deactivated road sign that leads to the lake. There is also access to the Mt. Gladstone trailhead from Hwy 3 and the abandoned CPR railway at Paulson, the Mt. Faith trailhead from the Burrell Forest Service Road, and Peter Lake from Dog Creek Road. The Gladstone Provincial Park Management Plan [PDF] defines the role of the park in the provincial protected area system. The plan provides long-term direction to guide management and development of the park. Issues addressed include the level of facility development, management of park access and management of natural, cultural and recreational values. The warm, clear water of Christina Lake is ideal for canoeing and kayaking. The park includes numerous sandy beaches on the west side of the lake that are accessible only by boat and make perfect picnic spots. Old growth cedar trees and pictographs are found on the east side of the lake and the north end provides opportunities for viewing kokanee spawning. Bicycles must keep to roadways. Bicycle helmets are mandatory in British Columbia. Mountain biking has designated trails. Fishing for Kokanee, rainbow trout and small-mouth bass is popular. Anyone fishing or angling in British Columbia must have an appropriate licence. There is no fishing north of a line between Bald Point and Knob Point between April 1 and May 31. Ice fishing is possible on Christina Lake depending on winter conditions. Horseback riding is permitted in the backcountry area on designated trails. Horseback riding is not allowed in the campground. Hunting is allowed in the park. Please check the BC Hunting & Trapping Regulations Synopsis for more information. The Mount Faith area draws people internationally for guided hunting provided by a licenced guide outfitter. There are opportunities for SCUBA diving in Christina Lake. A company based in Christina Lake called Blue Max Adventures in Diving, offers courses. There are no lifeguards on duty at provincial parks. Excellent and safe swimming area in the warm waters of Christina Lake. The campground is situated well above the lake but several pocket beaches are accessible. The beaches of coarse sand are separated by shrubs and some cottonwood trees that provide shade. A roughly 100m long, 2m wide gravel trail with a gentle slope leaves the campground between sites 2 and 3. This is the easiest trail to the beach. A variety of other narrow dirt trails cut straight down the bank in a series of stairs and switchbacks. On the main trail just above the beach are a rescue station, garbage can and two pit toilets. Christina Lake, with its warm clear water, is perfect for water skiing. The boat launch at the campground is heavily used. Boat launch and rentals are available at the Christina Lake Marina. There is limited cross-country skiing and snowshoeing in the Texas Creek campground. There are no defined trails. Locals ski on the Trans Canada Trail. There is a paved boat launch available at Texas Creek. It is open year-round though ice will limit use. It is located on Litchy Road between pieces of private property, 500m before the campground. There is a wide paved road with a single lane turn-around running off one side. The road slopes down to a double wide concrete ramp with two docks made of interlocking plastic blocks. There is a payphone and an information shelter beside the dock. Parking is across East Lake Road in two large gravel parking lots. There is one pit toilet by the parking lots. Please note: There is no long term trailer storage permitted at the Texas Creek boat launch. Any trailers left in the parking lot for more than 14 days per calendar year are subject to removal and fines. While campfires are allowed and campfire rings are provided at each campsite, we encourage visitors to conserve wood and protect the environment by minimizing the use of fire and using campstoves instead. Firewood can be purchased in the park or you may bring your own wood. Fees for firewood are set locally and may vary from park to park. Limited burning hours or campfire bans may be implemented. To preserve vegetation and ground cover, please don’t gather firewood from the area around your campsite or elsewhere in the park (this is a ticketable offence under the Park Act). Dead wood is an important habitat element for many plants and animals and adds organic matter to the soil. Cold water taps are located throughout the Texas Creek Campground. Taps are shut off during the off-season. Visitors can use Christina Lake day-use area located 10 km from the park. There are five flush toilets and five pit toilets in the Texas Creek Campground. Hot showers are available in the campground. There is no additional fee for their use. Shower facilities are for campground visitors only. Texas Creek campground offers 62 vehicle accessible campsites, including seven double sites. Campsite reservations are available for campsites in this park. The gate is locked during the off season. Most of the sites are large and shaded by a forest of Douglas fir mixed with some cedar, larch and Ponderosa pine; however, the double sites are medium to small in size. The forest has a thick understory of shrubs, including ocean spray, that offer privacy for the sites. The numerous trees may make backing into some sites difficult but most are easily accessed. Roads within the campground are gravel, with perimeter road being double lane and the others a little narrower. There is a phone beside site 3 and the nearest services are in Christina Lake. Check reservation board at campground entrance for pre-assigned site number. BC Senior’s Rate (day after Labour Day to June 14 only): $13.50 per senior party/night. Read the User Fees Policy for information on Senior Camping Discounts. This park has unique water accessible only camping opportunities on the west side of Christina Lake that are accessible by boat. Many are former Forest Service Recreation sites. Note: Facilities are limited. The Ole Johnson site is situated on Bald Point on the west side of Christina Lake. Access to this small bay of coarse sand is by boat, 7.5 km from the boat launch at Texas Creek. There are 10 walk-in sites with fire rings, two picnic tables and two benches. The forested uplands rise steeply off the beach and are broken up by rocky outcrops. There is evidence of historical use in the form of two old cabin sites belonging to miner Ole Johnson for whom the site is named. There are excellent swimming, fishing and hiking opportunities. Peter Lake has been used as a backcountry camp by past users. There is room for three tents beside the lake. There are no other facilities. There is no beach and swimming opportunities are limited. The lake contains rainbow trout and brook trout. There are opportunities for hiking up the ridge south of the lake for views into the Sandner Creek drainage. Xenia Lake has an old Forest Service Recreation site. There are two pit toilets and five picnic tables. Troy Creek is located at the extreme northwest corner of Christina Lake 10 km from the Texas Creek boat launch or 11.3 km hiking along the Deer Point/Troy Creek Trail. This small bay has a rocky shoreline backed by a mixed forest with some exceptional Western red cedar and Douglas fir. An old cabin provides evidence of past use of the site. There are great views across the lake and to the north as well as good fishing. There is one pit toilet and five picnic tables. A trail leads up to Xenia Lake. Parson Creek is located on the west side of Christina Lake opposite Deer Point 6 km from the Texas Creek boat launch accessible only by boat. The majority of the shoreline is rocky and the upland is heavily forested with few shrubs. The small beach is coarse gravel. There is one pit toilet and two picnic tables. Treadmill Creek is located on the west side of Christina Lake 5 km from the Texas Creek boat launch. This large beach of coarse sand is sheltered from prevailing south winds making it a great spot for swimming and fishing. It offers an excellent view of Sandner-Troy Creek at the head of the lake. The land slopes away from the beach in a series of terraces. There are two pit toilets and four picnic tables. Axel Johnson is located on the west side of Christina Lake 3 km from the Texas Creek boat launch. This isolated bay has a long sandy beach making it a good spot for swimming and waterskiing. There are views across the lake of rock slides. There are two pit toilets and four picnic tables. Starchuck Beach is located on the west side of Christina Lake almost opposite of Texas Creek. This large sandy beach area is the southern most site on the west side. It is a popular area for swimming and fishing. There are two pit toilets and four picnic tables. Trapper Creek can be accessed by either boat or from the Deer Point Trail. It is a small, semi-open site with swimming and fishing opportunities. There is one pit toilet and two picnic tables.